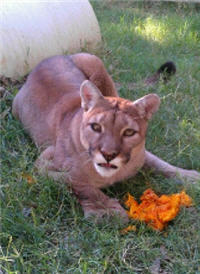 On July 1, 2011, In-Sync Exotic arrived at a private residence in Hunt County to check on some cats that we had been contacted about for placement. What we discovered was absolutely heartbreaking. The animals were living in filthy conditions—pools of urine and piles of feces were found in every enclosure, the cats desperately required medical care. 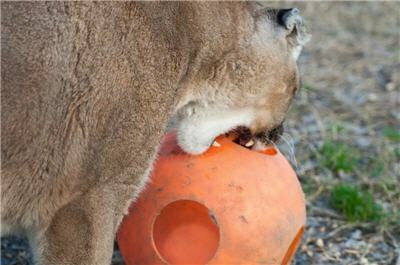 In-Sync took in nine animals—four lions (Aramis, Aurora, Layla and Eva) and five cougars (Spike, Kane, Abel, Howard, and Chloe). 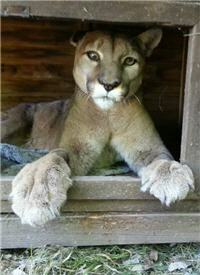 The remaining 12 cats were rehomed to other sanctuaries across the United States. The cage where Chloe and Howard lived was right next door to an adult male lion. 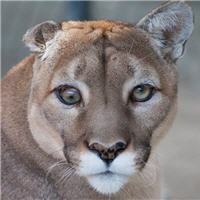 The wire that separated the two cougars from the lion had a mesh that was large enough for the cougars to put their legs through the fence. This put them in great danger of having their legs pulled through the fence by the lion, and we had seen Chloe do this a few times when we first arrived on the property. Chloe has had some damage to her right eye that it doesn’t move around like a normal eye should. She has also has had some kind of damage to her left back leg to the point that it looks somewhat deformed, but doesn’t seem to slow her down any at all. Chloe and Howard were inseparable. They slept together, ate together and played all the time. Chloe loves to knock a ball around. It doesn’t matter what kind of ball or what size, she will kick it around for hours at a time. 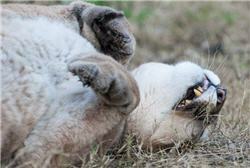 She has also learned how a cougar is supposed to live. Even though it did take her a while, she figured out how to jump on top of her den and climb the cat walks that get her up high above everything so that she can look down on the other cats that may be at play. Chloe was heartbroken when we lost Howard to his battle with cancer and we feel that she still misses him very much. We have tried to introduce Spike to her, but she has not been able to develop the same kind of bond with him. Chloe loves attention from her caregivers especially from our facilities coordinator. You can hear her purr with delight any time he is near her.